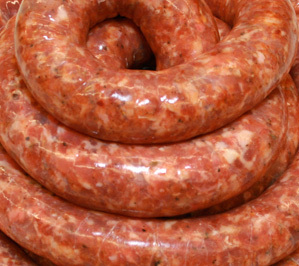 All Lou's Gourmet Sausage products are produced, packaged and delivered to your local store within hours of production. And with no preservatives. We take pride in flavoring our sausages with our own fresh seasonings--not pre-packaged blends other companies use. Our original Old World recipe of fresh pork and freshly ground spices make this our best seller for over 40 years. Available in link or 1/3 lb. sausage patties, enjoy the original taste of Italy today! With the addition of crushed red pepper, the flavor heats up our Old World recipe and adds a little spice to your life. Enjoy this fabulous flavor in your favorite pasta sauce or in an outstanding sausage sandwich from the grill. Add grilled onions to put it "over the top." With a blend of sweet red peppers, freshly cut scallions and our famous blend of Italian spices, this sausage packs an explosive flavor you won't believe! Seasoned to perfection, just cook and serve. Features chunks of aged Provolone cheese imported from Italy, blended together with Chardonnay wine and our famous blend of Italian spices. A true gourmet's delight! Created for those who love the taste of our famous Italian sausage yet prefer a lean alternative to pork. 95% lean chicken and our special spices make this sausage the perfect ingredient for low-calorie stir fry dishes or outdoor grilling. Serve with grilled onions, peppers and mushrooms for a unique sandwich experience. With a recipe straight from a famous French Quarter restaurant, our fresh Andouille is sure to satisfy your Cajun tastebuds. With a blend of cayenne pepper, onions, garlic and Cajun spices, it's perfect for your Creole and gumbo recipes. Seasoned with onion, garlic, cayenne pepper, chile pepper and other select spices, Lou's Chorizo has a traditional Mexican flair. The perfect match for recipes with a Southwestern feel. Our award-winning recipe has won the heart of Cleveland's ethnic community. With a blend of fresh pork, garlic and freshly ground spices, this Old World flavor truly "takes you home." Whether served with your best sauerkraut and dumplings or straight from the grill, your family will ask for Lou's Kielbasa time and time again. Made with fresh pork and special seasonings, our Bratwurst recipe adds that extra "oomph" to any meal. Great on the grill, turn your backyard into a Bavarian festival the next time you cook out.